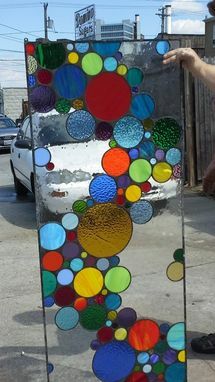 This lovely window, full of bright colors and interesting shapes, will embellish another customer's home! This one has hangers and a size of 22" X 55". Regarding glass, we used way too many types of glass to list them all. We just used everything we could find!! We have a lot of bubbles designs listed in our shop so, why don't you take a look at them? Maybe your home decor is needing a fun touch! Very happy with the finished product. Good value for the price and exactly what I wanted. Communication was excellent and the art arrived when promised! I would not hesitate to buy from this artist again! 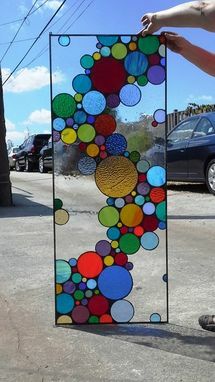 Beautiful stained glass! !